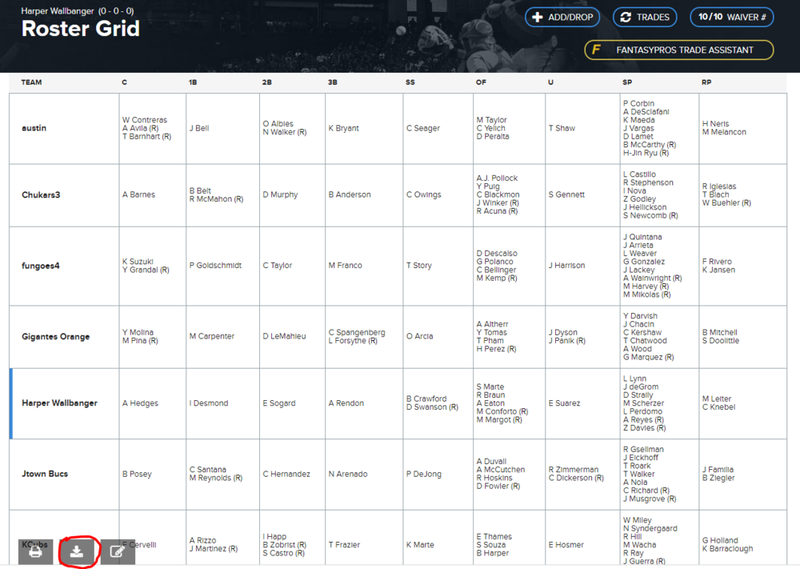 How to find your "LeagueID"
The Roster Import tool in the Big Board is able to automatically pull in rosters from ESPN, CBS, Yahoo, or Fleaflicker. What follows are a few screenshots to show where to find your "LeagueID", the only input needed to start the automatic import! Go to any of the pages in your league and you'll see the ID right in the URL. In this example league, the ID is 117375. Go to any of the pages in your league and you'll see the ID right in the URL. It's also displayed several other places in the Yahoo site itself, you can see it in the bottom left of this image in both the name of the league and in the parentheses next to it. In this example league, the ID is 131267. Go to any of the pages in your league and you'll see the ID right in the URL. In this example league, the ID is 18442. CBS player projections/rosters list. Click the button circled in red, download "projections.csv". CBS roster grid. Click the button circled in red, download "roster-grid.csv".